Curtis W. Mewbourne, a native of Shreveport, Louisiana, obtained a Bachelor of Science degree in Petroleum Engineering from the University of Oklahoma, where he has been honored as a Distinguished Graduate. After serving as an officer in the U.S. Army and working as a petroleum engineer in industry, he founded Mewbourne Oil Company in 1965. Mewbourne Oil is one of the most successful privately owned oil and gas producers in America. Mr. Mewbourne continues to operate the company privately. In recognition of his longtime support, the University of Oklahoma named the Mewbourne School of Petroleum and Geological Engineering in his honor in May of 2000, and granted him the Honorary Degree of Doctor of Humane Letters in 2002. 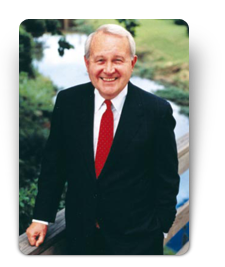 On November 2, 2007, the Mewbourne College of Earth & Energy was named in his honor and he was given the Trailblazer Award for his professional achievements and lifetime commitment to the energy center.